AFTINET Convener Dr Patricia Ranald said today that Australia should not proceed with the PACER-Plus trade deal between Australia, New Zealand and only 12 of the original 14 Pacific Island countries. The deal was finalised in Brisbane today, and may be formally signed in June. Dr Ranald said the two largest economies, Papua New Guinea and Fiji, have both refused to endorse the final text, saying it did not recognise their need to develop their infant industries. 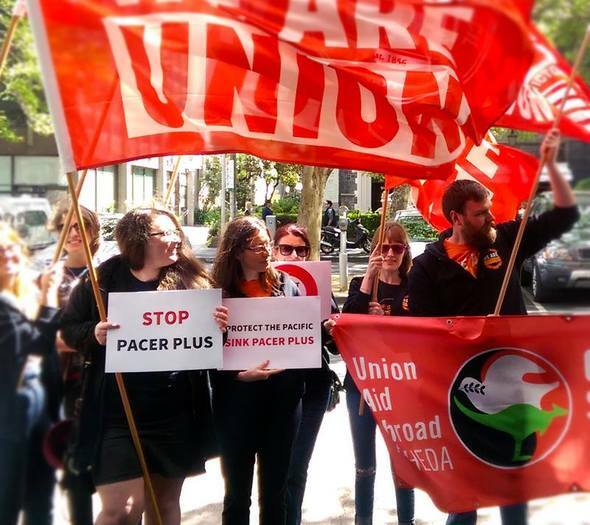 Without them, PACER-Plus has failed as a regional agreement. “PNG and Fiji’s rejection shows that the agreement is heavily skewed towards the interests of Australia and New Zealand - despite early rhetoric that the agreement was about development needs,” said Dr Ranald. The negotiations have been conducted in secret but leaked documents revealed many issues of concern to Pacific Island civil society groups. These are detailed in a recent report by the Pacific Network on Globalisation: Defending Pacific ways of life: A People’s Social Impact Assessment of PACER-Plus”. Dr Ranald said that the smaller economies in the Pacific have less negotiating power than Fiji and PNG, and that the Australian and New Zealand governments should not be pressuring vulnerable economies into a deal which does not benefit them. Pacific Island countries already have tariff-free access for their goods in Australia, so they get no extra market access. The main purpose of PACER-Plus is to reduce tariffs on Pacific Island imports from Australia and New Zealand and to reduce the ability of governments to regulate foreign investment in services and other sectors. “Tariff reductions would lead to significant revenue losses for smaller Pacific Island countries, which could impact on the ability of these governments to provide essential services to their populations,” said Dr Ranald. “Trade-in-services rules could also create pressure for privatisation and reduce the ability of governments to regulate to provide equitable access to essential services for vulnerable populations. “Pacific Island governments should not be pressured to sign an agreement that is not in the interests of their peoples”.